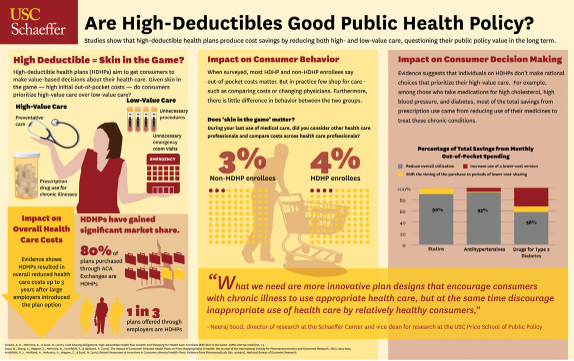 High-deductible health plans are touted for their money-saving potential, but a new USC study finds that they can greatly increase the risk of high out-of-pocket healthcare costs for Americans who are low-income or chronically ill — and may topple them into financial disaster. 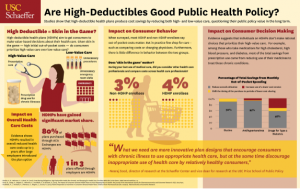 “These plans do have lower premiums and might seem affordable, but if you are low income or chronically ill, they might end up hurting you because you face a significantly higher risk of catastrophic out-of-pocket costs,” said Neeraj Sood, the study’s corresponding author and an expert on high-deductible plans at the USC Schaeffer Center for Health Policy and Economics. Prior research has defined excessive financial burden for a consumer as spending more than 3 percent of his or her income on health issues. The study, published on Thursday in The American Journal of Managed Care, was based on a 25 percent random sample of claims data from OptumInsight Clinformatics Data Mart, a subsidiary of UnitedHealth Group. 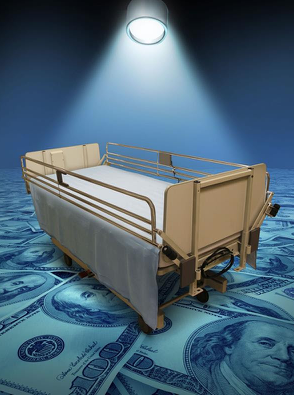 Advocates of the plans say high deductibles give consumers more skin in the game to become judicious price shoppers for health care services and stash money in their HSAs for basic care and emergencies. The premiums for high-deductible plans are lower than traditional plans. In 2013, employee premium contributions for single coverage averaged $726 a year for high deductible plans with an HSA, vs. $1,027 for a traditional plan.